Walking through the National Gallery’s superb exhibition Courtauld Impressionists: From Manet to Cézanne, it’s hard to fathom the tepid reception some of these world-famous pieces once received. In the 19th and early 20th century, many critics were wary of impressionism and post-impressionism’s radical new way of seeing things: Manet was misunderstood, Cézanne’s work was greeted with disdain, Monet remained penniless for much of his career and Van Gogh failed to see commercial success. In Britain, the pendulum of opinion swung the other way partly due to one man. Samuel Courtauld was a visionary businessman and philanthropist with considerable wealth. He also had a passion for French modern art and a strong belief in the benefit of art for the individual and society. Ignoring criticism, in the 1920s he began acquiring a vast private collection of impressionist and post-impressionist art – which now forms the core of the Courtauld Gallery – and established a generous fund for the National Gallery and the Tate to purchase other pieces for the nation. A Bar at the Folies-Bergère, 1882, Manet, Edouard (1832-1883). With the Courtauld closed for a two-year refurbishment, the National Gallery is hosting an exceptional exhibition that brings together 42 paintings from both collections. 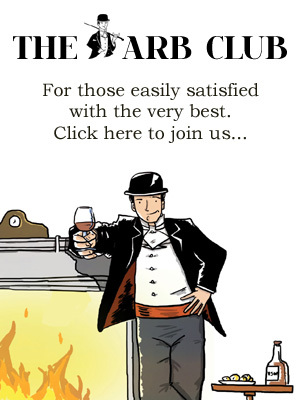 Manet, Cézanne, Renoir, Pissarro, Gauguin, Seurat, Monet, Toulouse-Lautrec, Daumier, Bonnard, Degas and Van Gogh all feature to stunning effect. In the exhibition’s opening room, the founders of impressionism jostle for attention from different walls. 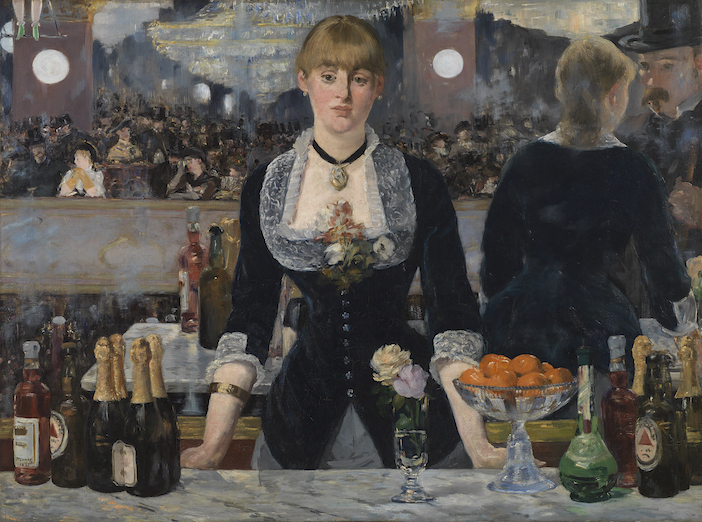 On one side, the barmaid from Manet’s A Bar at the Folies-Bergère stares introspectively, a figure of isolation; behind her, the famously mismatched scene reflected in the mirror leaves the viewer pondering the discrepancy between her inner and outer world. Across the room, a number of Degas paintings tell vastly different stories: the beguilingly shadowed Woman at a Window hangs in effective contrast to Young Spartans Exercising. 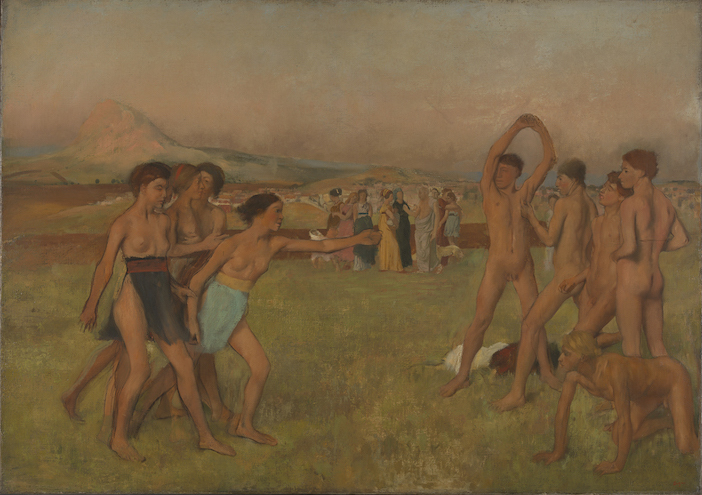 Suffused in olive and ochre, Degas’ mastery of colour and movement is in full effect as Spartan teenagers lunge at each other, watched by their mothers while the ominous Mount Taygetus looms in the background. Further along, Monet’s Antibesand Autumn Effect at Argenteuildiffuse light and colour with mesmerising effect. It’s no surprise that Argenteuilwas once promoted as the perfect example of impressionism. But it’s not just the quality of art on display that makes this exhibition so unique. It’s also the opportunity to see paintings shown together that are normally kept apart – revealing how impressionism unfurled in the hands of different artists and reflecting on the relationships between those artists. 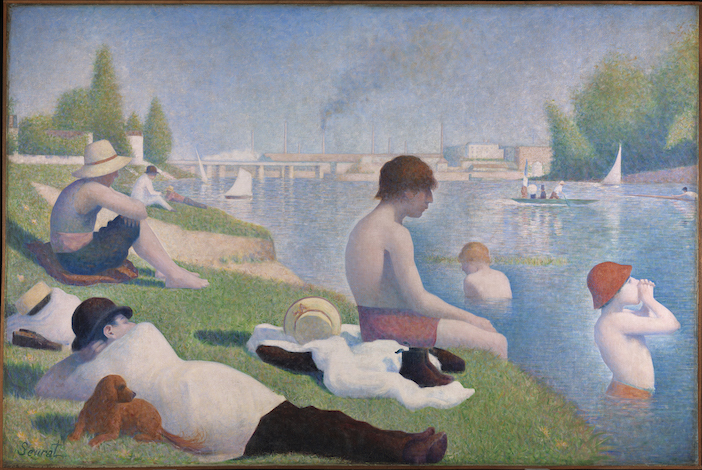 Work by ‘Father’ Pissarro – a mentor to Cézanne and Gauguin and an advocate of Seurat’s pointillist technique – hangs next to Seurat’s grand masterpiece, Bathers at Asnière. A beautifully saturated river scene by Manet depicts Monet’s wife and son, painted during a stay with the family (shown here at the head of the article). And in the closing room, post-impressionists Gauguin and Van Gogh, who had a close relationship before their dramatic fallout, are reunited. Placed beside each other, the bold, bright colours of their work amplify the artistic courage of their predecessors, while the inscrutable gaze of Gauguin’s Tahitian woman in Te Rerioa (The Dream) closes the exhibition with an echo of Manet’s enigmatic barmaid. The nine paintings by Cézanne on display are a particular highlight. Despite critics’ scepticism, Courtauld was an enthusiastic collector of the underappreciated artist, amassing 21 of his paintings in total. 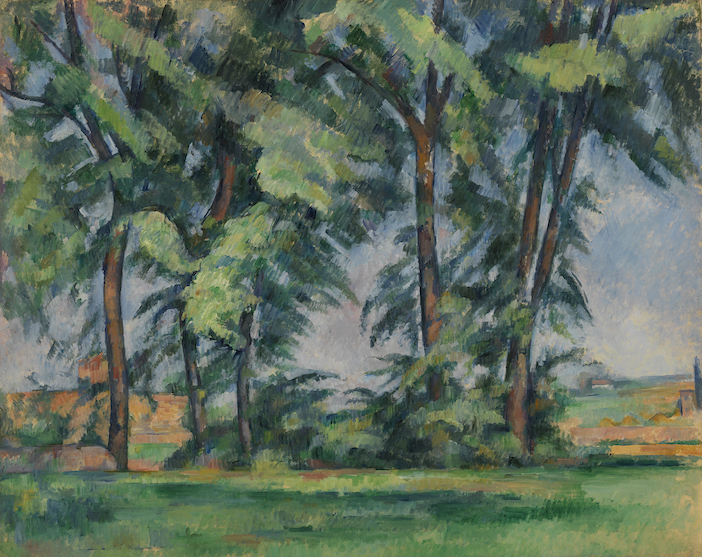 On seeing one of Cézanne’s landscapes in 1922, he said: “At that moment I felt the magic, and I have felt it in Cézanne’s work ever since.” Amongst the diverse selection of Cézanne’s art, from the intriguing Self Portrait to the celebrated Card Players, it is Tall Trees at the Jas de Couffan where that magic is most tangible. Capturing the verdant garden of Cézanne’s family home, the intensity of his work draws you into the landscape with magnetic effect. Tall Trees at the Jas de Bouffan, 1883 (circa), Paul Cézanne (1839-1906). Courtauld believed that unfettered imagination, human emotion and spiritual aspiration were needed to create and appreciate art. Thanks to a cultural legacy that is both material and conceptual, nearly 100 years after his collection began, there’s an exhibition that explores impressionism and post-impressionism as powerfully as this. 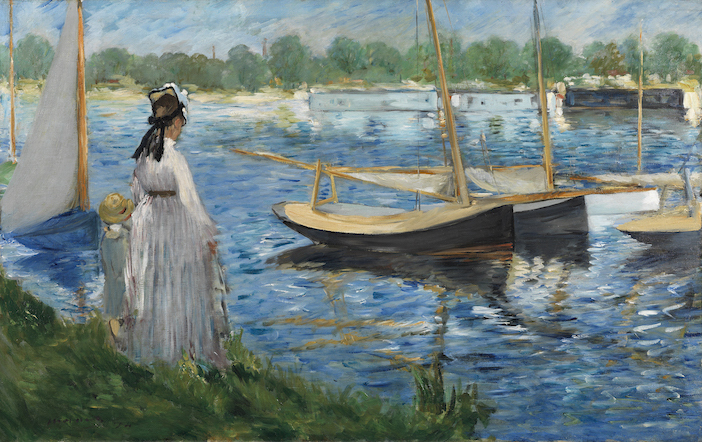 Courtauld Impressionists: From Manet to Cézanneis on at the National Gallery until 20 January 2019. To find out more, visit www.nationalgallery.org.uk.